METEO 300 is a prerequisite for this course while METEO 431 must at least be concurrent with this course. Mathematics through differential equations is a necessity for this course. A basic understanding of atmospheric thermal physics and classical electromagnetic theory is helpful, though all ideas pertinent to this course will be introduced within it. Students who do not meet these prerequisites after being informed in writing by the instructor may be dis-enrolled during the first 10-day free add-drop period: http:/www.psu.edu/dept/oue/aappm/C-5.html . If you have not completed the listed prerequisites, then promptly consult with the instructor if you have not done so already. Students who re-enroll after being dis-enrolled according to this policy are in violation of Item 15 on the Student Code of Conduct: http://studentaffairs.psu.edu/conduct/codeofconduct/ . No book is absolutely required for this course. The one closest in content to the course content is "Fundamentals of Atmospheric Radiation" by Craig Bohren and Eugene Clothiaux as it is hard to ignore the ideas that one has written about in a text book. C.F. Bohren What Light Through Yonder Window Breaks? All students will come to class prepared to discuss the course material at hand. Students are allowed to work on homework problems together. But, students must write-up their homework solutions on their own and have complete mastery of what it is that they have written. Students must meet the deadlines for the homework assignments. Habitual tardiness in turning in the homework will lead to a loss of points but only after a warning from the instructor. This course abides by the Penn State Class Attendance Policy 42-27: http://senate.psu.edu/policies/42-00.html#42-27 , Attendance Policy E-11: http://www.psu.edu/oue/aappm/E-11.html , and Conflict Exam Policy 44-35: http://www.psu.edu/ufs/policies/44-00.html#44-35 . Please also see Illness Verification Policy: http://studentaffairs.psu.edu/health/welcome/illnessVerification/ , and Religious Observance Policy: http://www.psu.edu/oue/aappm/R-4.html . Students who miss class for legitimate reasons will be given a reasonable opportunity to make up missed work, including exams and quizzes. Students are not required to secure the signature of medical personnel in the case of illness or injury and should use their best judgment on whether they are well enough to attend class or not; the University Health Center will not provide medical verification for minor illnesses or injuries. Other legitimate reasons for missing class include religious observance, family emergencies, and regularly scheduled university-approved curricular or extracurricular activities. Students who encounter serious family, health, or personal situations that result in extended absences should contact the Office of Student and Family Services for help: http://studentaffairs.psu.edu/familyservices/ . Whenever possible, students participating in University-approved activities should submit to the instructor a Class Absence Form available from the Registrar's Office: http://www.registrar.psu.edu/student_forms/ , at least one week prior to the activity. For a summary of General and Final Examination Policies 44-10 and 44-20 and alternative assessment practices, please see Examination Policy Summary: http://handbook.psu.edu/content/examinations and General and Final Exam Policies: http://senate.psu.edu/policies/44-00.html#44-10 . The only written assignments for this course will be homework assignments. The homework assignments must be completed according to course expectations listed above. Homework assignments will compose 20% of the final course grade. There will be two mid-term exams, each worth 25% of the final course grade, and a final exam worth 30% of the final course grade. The final exam will be given during the official exam slot scheduled for this course. The mid-term exams will be given at appropriate times during the semester at a time agreed upon by all. There will be an optional presentation available to all students that must be completed within the last month of class, but not the last week, that is worth 25% of the course grade and may be used as a substitute for one of the mid-term exam grades. There will be no grade curving. For the final course grade the instructor may throw out poor exam questions and adjust the percentages that homework and exams count. This will be done in the same way for all students and only in such a way as to help each student’s overall course grade. No student will receive a grade less than what is based on the homework (20%), mid-term exams (50%) and final exam (30%) percentages given above. Students in this class are expected to write up their homework sets individually and to work the exams on their own. Class members may work on the homework sets in groups, but then each student must write up the answers separately. Students are not to copy homework or exam answers from another person's paper and present them as their own. Students who present other people's work as their own will receive at least a 0 on the assignment and may well receive an F or XF in the course depending upon the circumstances. Please see: Earth and Mineral Sciences Academic Integrity Policy: http://www.ems.psu.edu/current_undergrad_students/academics/integrity_policy , which this course adopts. Penn State welcomes students with disabilities into the University's educational programs. Every Penn State campus has an office for students with disabilities. 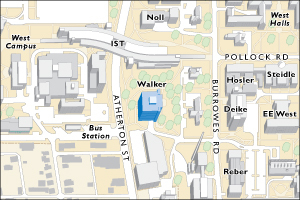 The Office for Disability Services (ODS) Web site provides contact information for every Penn State campus : http://equity.psu.edu/ods/dcl . For further information, please visit the Office for Disability Services Web site : http://equity.psu.edu/ods . In order to receive consideration for reasonable accommodations, you must contact the appropriate disability services office at the campus where you are officially enrolled, participate in an intake interview, and provide documentation : http://equity.psu.edu/ods/guidelines . If the documentation supports your request for reasonable accommodations, your campus’s disability services office will provide you with an accommodation letter. Campus emergencies, including weather delays, are announced on Penn State News: http:/news.psu.edu/ and communicated to cellphones, email, the Penn State Facebook page, and Twitter via PSUAlert ( Sign up at: https://psualert.psu.edu/psualert/ ).